Do the Detroit Red Wings Have a No. 1 Center in Dylan Larkin? Do the Red Wings Have a No. 1 Center in Larkin? Just like Eminem’s albums, the Detroit Red Wings have gone through phases. The last few years have been the “Relapse” chapter considering their struggles and attempts to right the sinking ship. This year—with their youth starting to take over—could be the beginning of their “Recovery” period. Before they reach their “Revival” stage, a few boxes need to be checked, one of which is to have a No. 1 center. 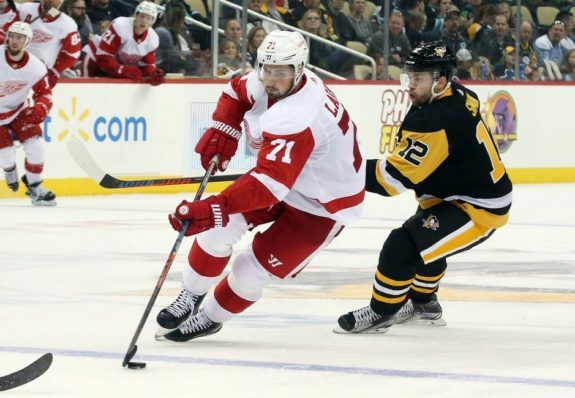 Is Dylan Larkin that player? Detroit had a bonafide top-line pivot for over a quarter-century – from the early days of Steve Yzerman, to Henrik Zetterberg’s last couple truly productive seasons. And while Larkin may not have the same ceiling as the Red Wings’ former captains, he might have the ability to become their much-needed No. 1 center. Let’s take a look at the statistics, attributes, and qualities that make up a No. 1 center and see how Larkin stacks up. Because once the Red Wings have their first-line center and a few other valuable pieces in place, then they can launch into their high-flying, offensive “Kamikaze” phase and contend for another Stanley Cup. First, let’s compare Larkin to the NHL’s top centers from a statistics standpoint. How does he measure up when it comes to points, shot attempts, faceoffs, and other relevant stat categories through Detroit’s first 18 games? Generally speaking, it’s a mixed bag for Larkin. He’s near the top of the league for points and is strong in the faceoff circle. However, his five-on-five numbers are pretty rough. Starting with his offensive production, Larkin’s point per game average does look promising. He’ll likely range between 70 and 80 points per season over the next five years, which is pretty solid when you compare him with other centers around the league. Last year, only 20 centers reached 70 points across the NHL, though you could argue a few primarily played on the wing (i.e. Jonathan Marchessault and Claude Giroux). Based on the early returns from this season, you can count Larkin among those players when the 2018-19 campaign concludes. But looking at Larkin’s five-on-five points per 60, he trails not only Andreas Athanasiou on the Red Wings, but also Darren Helm and Luke Glendening. His even-strength goals-for percentage is even worse. This is not ideal for an elite No. 1 center. From a statistics standpoint, Larkin should not be considered a No. 1 center. His even-strength numbers are just too weak at the moment. One aspect of Larkin’s game that no one can deny is his leadership. After Zetterberg’s departure, the young center seamlessly stepped into the long-time Red Wing’s former role as the team leader on and off the ice. Larkin’s never-quit attitude and constant drive to improve his game make him a great role model for the next generation of Red Wings. Though he’s not wearing the “C” in Detroit, he will soon. In addition, head coach Jeff Blashill can trust Larkin in any situation. He’s on Detroit’s top power play and penalty kill units and is constantly leading or near the top for all-situations time on ice among forwards. He’s clearly the go-to forward in Hockeytown. Finally, Larkin’s vision and playmaking skills are quickly improving, making him a constant threat on the ice. Instant game-changing ability? Not quite yet, but his speed, quick shot, and ability to draw multiple defenders make him very dangerous in the offensive zone, even if the stats aren’t there yet. At this very moment in time, Larkin should not be considered a No. 1 center. His five-on-five stats—most notably, his six goals for and 14 goals against—do not resemble that of an elite, two-way NHL pivot. However, the season is still young and Larkin can improve his numbers over the course of the remaining 64 games. 18 contests is a small sample size. So for now, it’s a no for the No. 1 center question, but it should be asked once again after the 2018-19 NHL season concludes. 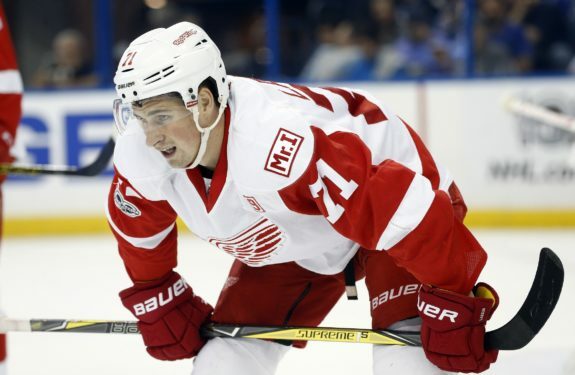 Should the Detroit Red Wings consider Dylan Larkin a No. 1 center? Share your thoughts below.